Longhorn SideBar adds a sidebar on the user's Windows Desktop providing Active Desktop features. 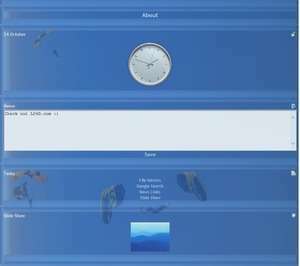 The Longhorn Sidebar element comes with the following sections: About, Date and Longhorn Clock, Memo, Slide Show, Search with Google, File Mirrors Search, News Links. For security reasons, you should also check out the Longhorn SideBar download at LO4D.com which includes virus and malware tests. Additional screenshots of this application download may be available, too.